While diversifying the toolbelt of water management strategies will likely help insulate the state against loss, a group of researchers at Stanford University are drawing attention to a risk they say has long ridden under the radar of public consciousness: the introduction of dangerous chemicals into California groundwater, both through industrial and natural pathways. Chromium exists naturally in two main forms that are dependent on the local chemistry of the soils. One — chromium-3 (Cr-3) — is benign, and in fact can be beneficial in the body. But chromium-6 (Cr-6) is toxic, linked by the Occupational Safety and Health Administration with health issues including asthma-like symptoms, irritation of the nose, throat, eyes or skin, and in extreme cases lung cancer. New research draws from a growing database of groundwater data to map the elemental metal chromium in wells across the state. Researchers included wells used by government agencies to monitor pollution and the progress of cleaning projects, in addition to wells used for drinking water. While it occurs naturally, it can also enter the ground through human activities. "People know we have industrial contamination," says Scott Fendorf a Stanford soil chemist and co-author on the study. “That is clear within the data." Fendorf points to the work of activists who are fighting against industrial pollution, as Erin Brockovich did in her 1993 court case against Pacific Gas & Electric. "That's just not the only threat to groundwater. If you're thinking larger, the natural contaminants are really widespread." 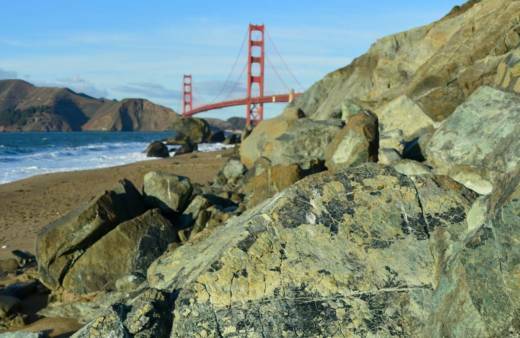 This is particularly true in California, Fendorf says, where the geology is rich in chromium-carrying rocks. Fendorf and his collaborators found that all of the almost 16,000 wells they analyzed — spread throughout the majority of the state — showed Cr-6 present in low trace amounts. However, a smaller subset of wells, including 26 percent of monitoring wells and 7 percent of supply wells, had levels high enough to exceed a previous state-mandated maximum contaminant level (MCL) of 10 parts per billion (ppb). In addition to mapping chromium exposure throughout California, researchers wanted to identify the sources. By looking at other compounds found alongside Cr-6, they were able to identify three possible points of contamination: industry, agriculture, and natural input. Industries such as metal plating were linked to high Cr-6 levels in the areas outside of Los Angeles and the San Francisco Bay. Los Angeles is the largest manufacturing center in the United States, and San Francisco's proximity to Silicon Valley drives much of its industrial growth. In the more rural Central Valley, researchers found that chromium was being introduced into the groundwater through agricultural practices. The heavy use of fertilizers meant that chromium was often found alongside nitrogen-based compounds which provide nutrients for crops. But parts of the Central Valley also pointed to a different source, one that researchers highlighted in their study: the presence of natural chromium in the land itself and its ability to shift from benign to toxic over time. Within the rocks, chromium is found in areas where oceanic and continental plates come together, as in California where the Pacific plate and North American Plate meet along the San Andreas Fault. 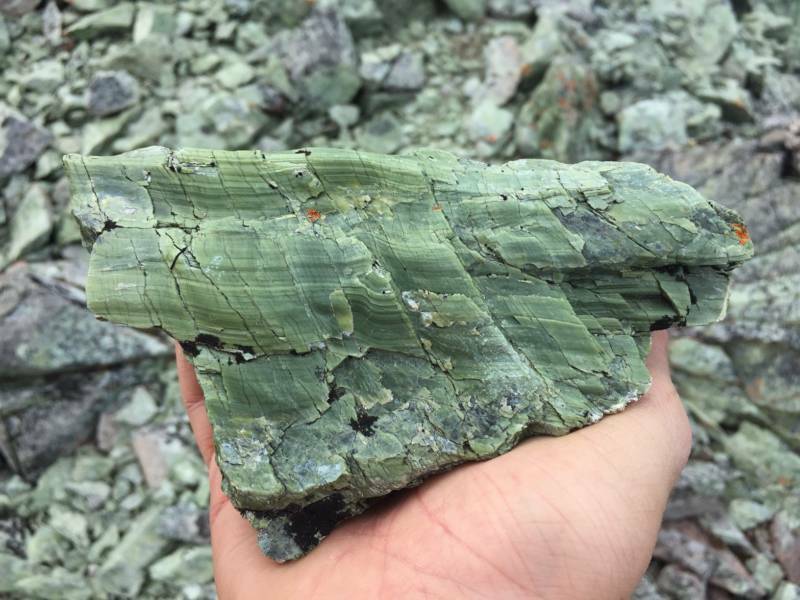 Serpentinite is a common rock found in these zones, to which chromium lends a distinctive green color. Natural sources explained the chromium concentrations in the Sacramento and San Joaquin Valleys, which are close to natural outcroppings of serpentinite. It also explained how more isolated areas such as the Mojave could have elevated chromium levels despite being far from sources of industrial pollution. But according to Fendorf, humans have the capability to aggravate these natural processes through their activities. The intentional use of chemicals to clean up toxic industrial contamination in the soil (called in-situ chemical oxidation), for example, can have the unintended consequence of turning the relatively harmless form (Cr-3) into the more dangerous from (Cr-6). Another culprit, he says, is the overdrawing of water from the underlying aquifer, often for agricultural use. The water table is made of many stacked layers, alternating between sections of loose, wet gravel and sand and tightly-packed layers of fine clay. "The clay acts as a sponge with all this naturally chromium-rich dirty water in it," says Fendorf, "And when you start overdrawing, you put pressure on the clays and start pushing dirty water into the main water that you're pumping out." Ultimately, Fendorf's work shows that industry and agriculture are responsible for the most concentrated sources of chromium contamination. However, the effects of natural chromium impact a much larger area of California and a greater proportion of the drinking water supply. But despite the fact that chromium is present throughout California, federal and state agencies are still scrambling to decide on an acceptable minimum level. While the EPA is tasked with setting federal MCLs, the maximum permissible level of a contaminant in drinking water, California has historically set many of its own thresholds with respect to environmental regulations. In July 2014, California set the state MCL for Cr-6 in drinking water at 10 ppb due to the perceived risks of exposure. However, in September 2017 this threshold was suspended by a court ruling for failing to consider the cost to agencies and industries attempting to comply with the ruling. Currently, the federal MCL (100 ppb) and the state MCL (50 ppb) are at odds, with both entities working to establish new guidelines based on updated regulations. Fortunately, there are promising methods for treating toxic chromium contamination on the horizon. Steve Bigley is the Director for the Environmental Services department at the Coachella Valley Water District, a district whose boundaries are split down the middle by the San Andreas Fault. With so much naturally-occurring chromium ground up into the sands along the fault, management officials here have had to grapple with the Cr-6 issue for decades. As many as a third of their drinking water supply wells, all of which are pulling from local groundwater sources, were found to exceed the 10 ppb limit. When the state rescinded its MCL in 2014, Bigley and his team had already begun a project to install costly treatment facilities to remove Cr-6 and remain compliant with the law. With the regulations currently under review, Bigley says they were able to table such expensive projects and experiment with promising new technologies. The water district recently completed a full-scale pilot project to reduce Cr-6 to the relatively harmless Cr-3 using stannous chloride, an approved drinking water and food additive. They were able to quickly deploy inexpensive, easy-to-operate equipment capable of treating an entire water system over the course of two months. "The benefits go so far beyond cost," Bigley says. "It is much more environmentally friendly because it has a much smaller footprint and doesn't produce the toxic wastes that come with conventional treatment technologies." At the broader state level, water management agencies are taking notice. Darrin Polhemus is the Deputy Director of the California State Water Resources Control Board's Division of Water Quality, and he has made Cr-6 assessments priority number one for his department in 2018. Following the removal of the previous regulations, they are now working with the Office of Environmental Health Hazard Assessment to establish a new MCL which balances a suggested Public Health Goal of 50 ppb against the economic cost inherent in treating affected drinking water. "We’re not just trying to plug the hole that a judge found in our previous regulations," he said. "We want to do a thorough job from scratch to incorporate new technology and research." He points to stannous chloride as one of several advances that have lowered the cost of treatment since the last round of research a decade ago. The State Water Resources Control Board expects to have a draft of their recommendation ready for public comment in the summer of 2019 and a final MCL established six to nine months later.